I offer copywriting and editing for both business publications (websites, annual reports, brochures, etc.) and literary works (essays, fiction, poetry, etc.). New: Custom poems available for weddings, births, birthdays, or any other special event or person in your life! Get in touch for details. 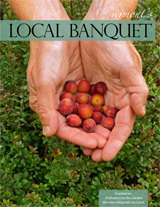 I've been a regular contributor to Vermont's Local Banquet since its third issue in 2008. My pieces for them have included both personal and journalistic essays.